An increasing number of foods are labelled natural or organic. Some grocery stores even market themselves as natural food markets. But what does it mean to eat "all natural," and what are the benefits? Understanding product labels and the benefits of an all-natural diet can help you make wise food choices. According to the Organic Trade Association, "Neither the FDA nor the USDA has rules or regulations for products labeled 'natural.'" Only in the case of meat and poultry does the USDA regulate the term "natural," stipulating that products cannot contain artificial ingredients or added color. In addition, natural meats and poultry may only be minimally processed. 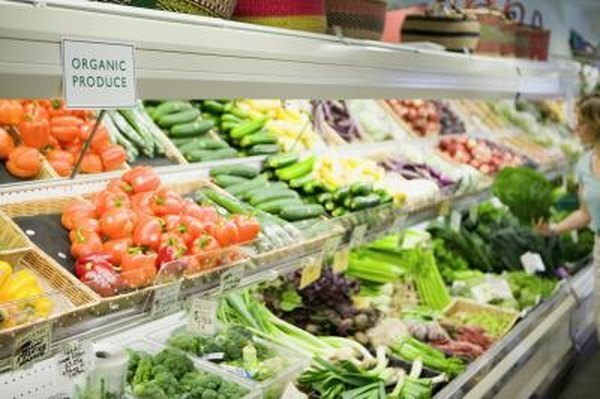 The United States does set guidelines for organic foods, and foods meeting these regulations can display the recognizable USDA organic label. Organic foods and food production cannot utilize toxic pesticides, hormones, petroleum-based fertilizers, genetically modified organisms or artificial ingredients such as colors, flavors or preservatives. To familiarize yourself with all-natural foods, begin by reading food labels and ingredient lists. Look for recognizable ingredients that come from whole food sources such as whole grains, pure fruit juices, nitrate-free meats, natural flavorings and natural sweeteners such as raw honey or maple syrup. Be wary of packaged foods that use the term "natural," as they can mislead you into thinking the product is healthy. Packaged foods such as microwave meals and canned soups often contain high amounts of fat, sugar and sodium even if they incorporate all-natural ingredients. Also be wary of ingredients that come from natural sources but have been highly processed or refined, such as flours and sweeteners. Beneficial nutrients are lost during processing. One benefit of eating all-natural foods is a reduction in the consumption of artificial flavorings, colorings and preservatives. Consumers might avoid these products if they are trying to reduce chemical allergies or sensitivities. MSG is an example of a common flavor-enhancer to which some people are allergic. In addition, minimally processed all-natural and organic foods are more likely to contain whole food sources of beneficial nutrients such as fiber, complex carbohydrates, vitamins and minerals. The benefits of an organic, all-natural diet include reduced consumption of unwanted or potentially harmful substances such as hormones, pesticides, fertilizers and artificial ingredients. According to the 2010 President's Cancer Panel, these substances can be potentially toxic or cancer-causing. Another benefit to choosing organically farmed or raised foods is the reduced environmental impact. According to the Organic Trade Association, choosing organic products helps prevent air and water pollution and reduces nutrient depletion of crop soil.